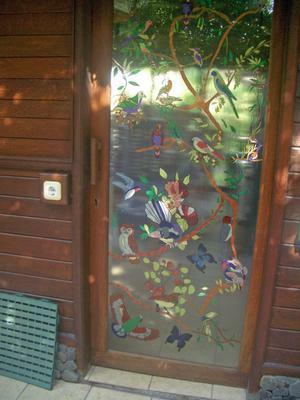 Hereby a picture of a door in my studio which I glass painted with Australian birds. This is a huge undertaking and so very beautiful! Thank you so much for sharing. I'm terribly sorry but my mother Jogry has recently passed away at age 83 on Dec 9 2016. She was indeed very talented and I'm extremely proud of her and all her artworks. This door was simply amazing & still stands in their home in Bali to this day.